TBMax Cat 6 Ethernet Cables are designed to meet the High Speed booming internet requirements, cables standard and interconnect technologies. With a flat design, it's much easier to deploy in any places than traditional round cables. 10 Gbps High Speed. Slim and Flat, Super Flexible: With 1.4 mm thin, the TBMax flat cables slide under the carpet without raising it or showing that it is under there. Turn corners easily, you do not have to drill holes in walls or floors, the flat cables go through the doorways smoothly. Easy to wrap. Rolls up nicely and is compact when traveling. High Speed and Reliable: The TBMax cable provides exceptional transmission performance and low signal losses. It supports up to 250 MHz and is suitable for Fast Ethernet, Gigabit Ethernet. Compared to the Cat5/Cat5e Ethernet cable, the improved quality in twisting of the wires provides better immunity from crosstalk, noise and interference that can degrade the signal quality. 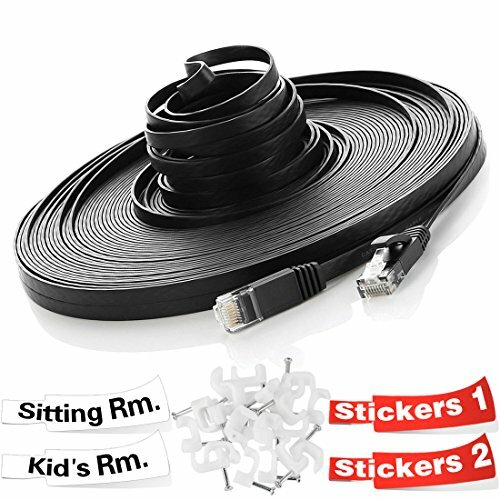 Best for Home and Office Network: The RJ45 connectors offer universal connectivity to computers and network components, such as routers, switch boxes, network printers and network attached storage devices. Premium snagless-type moldings to protect the connection. Surf the Internet, play online games, stream video, music and other data at greater speed without worrying about cable mess. Position and lock your long cable by clips and name your cable with labels to identify the destination or function of the cable, well organized and recognizable. Specification: Category 6 Patch Cable CAT6 4-Pair UTP Cable Outside Diameter: 0.23 ± 0.01 inch 100% Bare Copper Backward compatible with Cat5e/Cat5 Supports: 1000 BASE-T, 100 BASE-T, 10 BASE-T Snagless RJ45 connectors 4 pairs of stranded copper wire. ROHS EIA/TIA compliant Length: 50 feet. Compatibility: Routers Switches Network Printers Network Attached Storage Device Computer and network components.